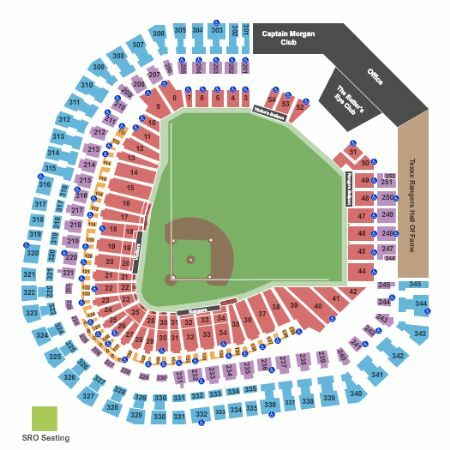 Texas Rangers vs. Oakland Athletics Tickets - 6/8/2019 - Globe Life Park in Arlington at Stub.com! PARKING ONLY !!! Not an event ticket. 2100 E. Randol Mill Rd. Does not include admission to event. Tickets will be ready for delivery by Jun 04, 2019. 2115 E. Randol Mill Rd. Mobile Entry Tickets. Must have smart device on hand to enter event. Do not print these tickets. Tickets will be ready for delivery by Jun 07, 2019. Mobile Entry Tickets. Must have smart device on hand to enter event. Do not print these tickets. Tickets will be ready for delivery by Jun 05, 2019. Mobile Entry Tickets. Must have smart device on hand to enter event. Do not print these tickets. Tickets will be ready for delivery by Jun 06, 2019. Does not include admission to event. Tickets will be ready for delivery by Jun 07, 2019. Second row in this section. Tickets will be ready for delivery by Jun 06, 2019. Tickets will be ready for delivery by Jun 06, 2019. Fourth row in this section. Mobile Entry Tickets. Must have smart device on hand to enter event. Tickets will be ready for delivery by Jun 04, 2019. Mobile Entry Tickets. Must have smart device on hand to enter event. Do not print these tickets. Tickets will be ready for delivery by May 30, 2019. Tickets will be ready for delivery by Apr 28, 2019. Fourth row in this section. Tickets will be ready for delivery by Jun 06, 2019. Mobile Entry Tickets. Must have smart device on hand to enter event. Tickets will be ready for delivery by Jun 06, 2019. First row in this section. Tickets will be ready for delivery by Jun 06, 2019. Third row in this section. Tickets will be ready for delivery by Jun 06, 2019. These tickets are an Obstructed View and your view of the action and the stage/set/field will occasionally be blocked. Tickets will be ready for delivery by Jun 04, 2019. MobileQR Entry. Scan your tickets from your mobile phone for this event. Do not print these tickets. Parking Pass Only. Does not include admission to event. MobileQR Entry. Scan your ticket from your mobile phone for this event. Do not print these tickets. Reserved parking pass. Tickets will be ready for delivery by Jun 04, 2019. Tickets will be ready for delivery by Jun 07, 2019. Mobile Entry Tickets. Must have smart device on hand to enter event. Do not print these tickets. Tickets will be ready for delivery by Jun 08, 2019. These seats are on the aisle with purchase of the entire group. Tickets will be ready for delivery by Jun 06, 2019. Includes access to the Capital One Club after the 3rd inning. Second row in this section. Standard Hotel Package includes 2 nights at a 4-Star hotel near the venue (check-in day before game, check-out day after game) | Lower Infield game ticket in sections 18 thru 34 (orders of three or more may be split) | $25 food/beverage credit included with each ticket | MLB merchandise of your choosing valued at $50 per person redeemable online only | Ticket upgrades - additional hotel nights or specific days may be obtainable upon request | Rate is based on double occupancy | Orders for a quantity of one are subject to an additional charge |. Deluxe Hotel Package includes 2 nights at a 4-Star hotel near the venue (check-in day before game, check-out day after game) | Roundtrip airport transfers | Game ticket with VIP amenities in Lexus Club Box sections 217 thru 235 featuring access to exclusive club lounges, wide spacious seating and in-seat wait service (orders of three or more may be split) | $25 food/beverage credit included with each ticket | MLB merchandise of your choosing valued at $50 per person redeemable online only | Ticket upgrades - additional hotel nights or specific days may be obtainable upon request | Rate is based on double occupancy | Orders for a quantity of one are subject to an additional charge |.